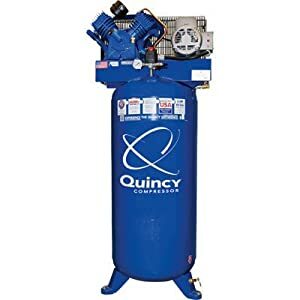 Best 60 Gallon Air Compressor: Only 5 Out of 86 for April 2019! 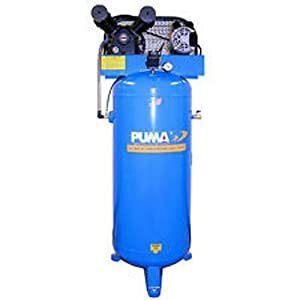 An air compressor is a necessary tool in any workshop and having one of these in your metal storage cabinet, like a tape measure, a hammer or a workbench. Of course, choosing any tool is quite a difficult process, because you’ll have to consider too many details and to read a lot of texts, reviews, and feedbacks. Well, let’s start at the very beginning. 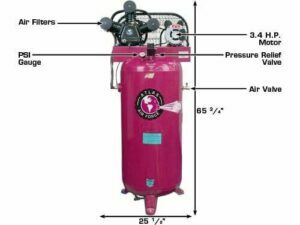 Why do you need an air compressor? The thing is, it’s an extremely multifunctional tool which can be used for various purposes. You can use it for spray painting (if you add it to a spray gun, of course), for cleaning (just like in the pressure washing service down the street), like a nail gun (forget about your hammer! ), and that’s not all. It’s only up to you how to use it, but there’s one thing I know. It goes like this: once you do something with your new air compressor, you’ll never want to do it without this tool. These power tools are extremely useful, so let’s choose a good one together. The very first step is determining the tank size. 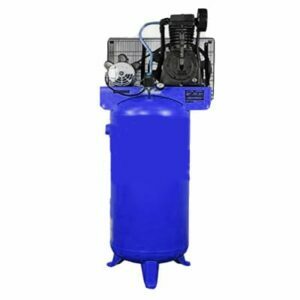 60 and 80-gallon tanks are the most popular options, and 60-gallon compressors are smaller, cheaper, quieter and, well, you can always add a 20-gallon tank to them (while you can’t take 20 gals away from an 80 gal tank). That’s why they are better, in my opinion. They are small, their ergonomics are better and they are more flexible, unlike their 80 gal counterparts. 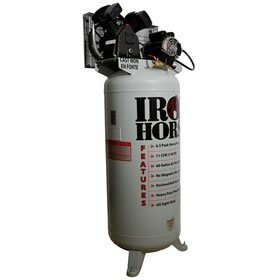 That’s why the choice is quite clear for me — a 60-gallon air compressor is a winner here. Another important thing you should think about is the engine of the compressor. The amount of HP and the CFM is extremely important — 2-5 HP would be enough for the absolute majority of the DIY activities. Well, there are professional compressors with 10-15 HP engines, but if you don’t have a large and professional shop (and if DIY activities are just your hobby), you most likely don’t need such monsters. As for the CFM, it’s not that simple. CFM means Cubic Feet per Minute, and it’s basically the volume of the air that is pushed out by your air compressor, and here more is the better — but 11-14 would be enough for the majority of users. CFM depends on the pressure (PSI, which is “Pounds per Square Inch”), and the higher is the PSI, the lower is the CFM. I’ll talk about it in detail for each compressor on this list. The last thing you have to take into account is the stage. I’m talking about the single stage and dual stage compressors — you’ll have to make a choice between these two. But it isn’t difficult at all. The dual stage compressors are more expensive and powerful than the one stage tools. Their working pressure is higher and they have more powerful engines. It makes sense that they would be the best choice for an auto shop or for a pressing plant, but if you are an independent craftsman, I recommend you pay attention to single stage compressors. I’ve included both single stage and dual stage compressors in my list, so there’s something for everyone here. Let’s go. It’s a simple, good and very interesting choice for individuals. I doubt that this compressor would be a good choice for a large mechanic shop, for example, but if you are looking for something not-too-expensive, pay attention to this tool. It’s not too powerful (the electric motor provides 3.7 HP), but its max PSI is 155 and CFM is quite high, too (13.4 at 40 PSI, 11.5 at 90 PSI). It’s enough for painting, roof nailing, airbrushing, blow cleaning, airbrushing, nailing, etc. The voltage can be both 208V and 240V. This compressor is quite loud (83 dBA), but, well, they all are loud, so it’s not a disadvantage. And it’s much quieter than the oil-free compressors because the pump is lubricated with oil. The tank is vertical, it’s made of steel and the durability of Industrial Air products is well-known, so you most likely don’t have to worry about it at all. There are two cylinders which means ILE3606056 compresses the air better than the tools with 1 cylinder. If you want to modify this compressor, I recommend to look at the hour meter made by SuntekStore and at this lubricant by Royal Purple (it’s designed for air compressors). Here you’ll find the operator manual by the manufacturer, the Industrial Air company. It’s another compressor that would work perfectly for painting, blow cleaning and nailing. It’s not the best choice for a large shop, just like the previous compressor, but if doesn’t need a professional tool and if your budget is quite small, that’s a very reasonable choice. The motor is not very powerful here — 3 horsepower electric motor outputs up to 135 PSI (with 13.5 CFM at 40 PSI and 12 CFM at 90 PSI). This Puma Industries compressor is quiet, unlike the previous one. Another thing I liked was its weight — of course I can hardly call it a portable air compressor, but its size is not too large and it weighs only 295 lb (133 kg). 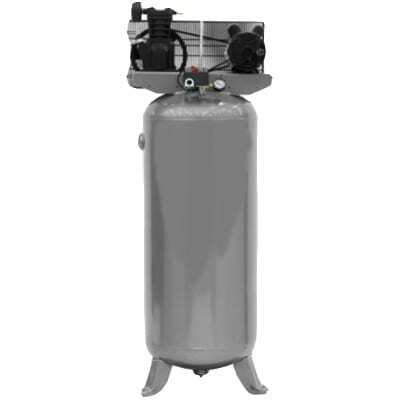 What I can say about PK-6060V is that it’s probably the best 60 gallon air compressor for the money. It’s not a serious tool for professional craftsmen (they cost more than $1,500), but it will still cope with work. This compressor has almost the same motor as the previous compressors by the Puma Industries and Industrial Air. However, it’s a little bit better (and more expensive, too). Let’s see why. So, the motor seems to be very similar — 3.2 horsepower, 208/230 Volts, single phase. But the most interesting thing here is that it can output up to 6.5 horsepower, which makes it the most powerful compressor on this list! The maximum PSI is 150 (however, the users say that it’s really 135, not 150), with 11.2 CFM at 90 PSI, there are 2 cylinders and a special V-styled design of the compressor won’t don’t let it overheat. It’s a very decent, powerful and quiet tool, with no doubts. I would recommend it to everyone who wants a compressor for painting/sanding/blowing tires up/etc. And for everyone who doesn’t want to spend a lot of money, of course. Big, powerful, expensive, dual stage. 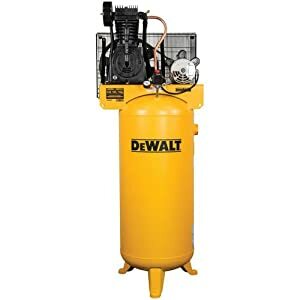 It’s all about this DeWalt air compressor. 230V motor outputs 5 horsepower and 13.5 CFM at 175 PSI (15 CFM at 100 PSI), which means it’s a very powerful tool that can work with several devices simultaneously (unlike all the other compressors on the list). The design of the motor, belt guard, and pump will not let the compressor overheat. The performance of DXCMV5076055 is perfect and makes it the best air compressor that could cope with all the activities. It’s basically a premium device, and it’s not only about its price, of course. As any other dual-stage compressor, this one would be a great choice for a professional shop with two or more workers. And as with every other dual-stage compressor, this tool by Dewalt is quite heavy (400 lbs or 180 kg), so it’s very far from a portable compressor. Well, we always have to choose. I recommend to buy the oil made by the same manufacturer, Dewalt — you won’t need to change oil often, but it’s always better to make a reserve, right? This master kit from Maxline would be useful, too. It’s another expensive and professional dual stage air compressor, and it’s worth every penny. The engine is very powerful, like in all 2-stage compressors — 5 horsepower would be enough for all types of work, RPM is very high (3,450) so it pumps up really fast and you will not have to wait. 4 cylinder pump that runs at 1310 RPM is a very powerful type of pump (and quite noisy, let’s admit it), the working PSI is 150-175, and there are no works this compressor can’t handle. I hope that you’ve already got the idea: powerful compressors can’t be portable. This one isn’t an exception — it’s weight, 580 lbs (263 kg), makes it the heaviest tool on this list so you shouldn’t expect it to be small and lightweight. I highly recommend to buy the maintenance kit together with this compressor, as well as the hour meter — that’s how you will improve the performance and save on future purchases. I hope you find something here. I’ve tried to include all the most popular compressors, from quite cheap and simple 3.7 horsepower compressor from the Industrial Air, to expensive, big and really powerful Quincy QT-54. That’s why, whether you need a cheap workhorse or a professional tool for your workshop, you’ve come to the right place. I’ve also added some additional items you’ll have to buy to make your life a little bit easier. My last recommendation is: think about the tank size one more time. 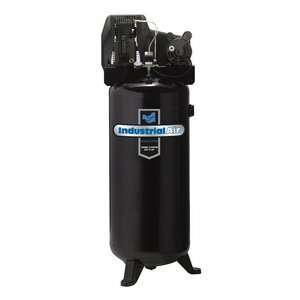 If you are going to use a compressor outside, or if your purposes are not very serious (like blowing the tires up or something), there are 20, 8 and even 3 gallon compressors that would be a better choice. However, if you’ve considered all the pros and cons, if you need something bigger and more powerful, and if you’ve chosen 60 gallon tanks, I’m here and I’m always ready to help you.